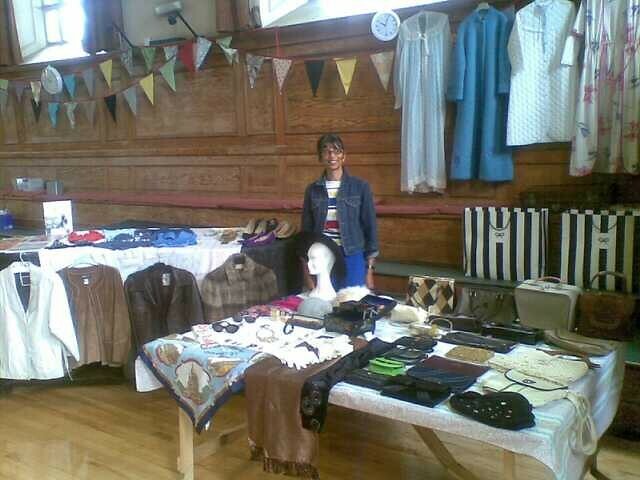 It was a really lovely day at the Vintage Fashion Fair held at Cecil Sharp House in Primrose Hill. While we were waiting to go in, at about 8:35, across the road I saw the model Agyness Deyn walking by-she looked over so I smiled and she smiled back!! A great start to the morning, lol!! Once indoors and set up, doors opened at 11am and although it was fairly quiet on the visitors front, there were still sales to be had. 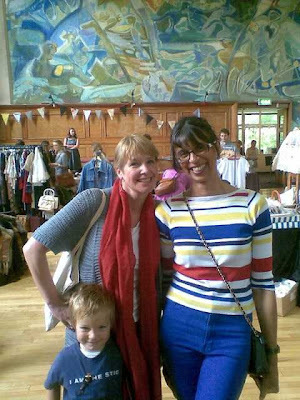 It was a really lovely, genteel atmosphere too-its so nice to meet new people and its fabulous to see your items for sale going to someone who really is enthralled with their new purchase!! My stall on Sunday-it was great to have a spacious pitch, I had use of the piano, two tables and my two hanging rails-all ready for business!! 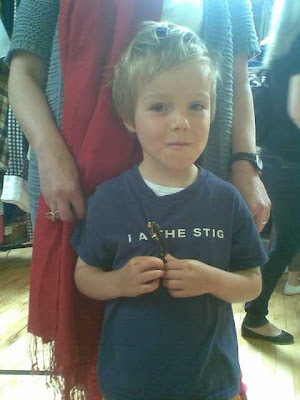 I didn't have to wait long for a V.I.P, a most discerning customer who knew straightaway what item he wanted-I wish all my customers could be like him. A very satisfied and handsome young customer-thank you for your purchase and do come again!! 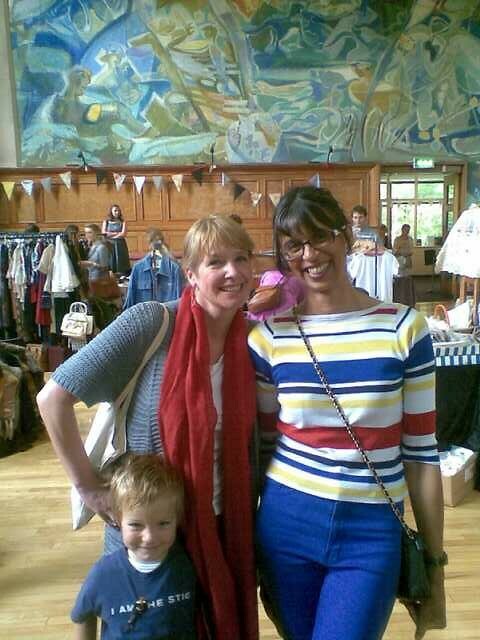 Of course, me and mum had to get in on the picture, and as you can see we are both wearing bright colours-Kate is rocking her red scarf and jeans and I'm in my cobalt blue 90s Versace jeans and stripey top! A picnic was beckoning for Le Petit Garcon and mum, so we bade farewell and they went on their way. The day soon went very quickly with some last minute sales before closing time. The next fair is on 5 June, it would be great to see you and you can apply for free tickets here a little nearer the time. Its a lovely trip out and is great for all budgets, whether you want a little treat or a special purchase, then a unique vintage item may just be what you're after to mix in with a high street, designer or modern outfit. You look so stylish, the space looks beautiful and very well organized and I wish I could be there next time to chat and shop with you. 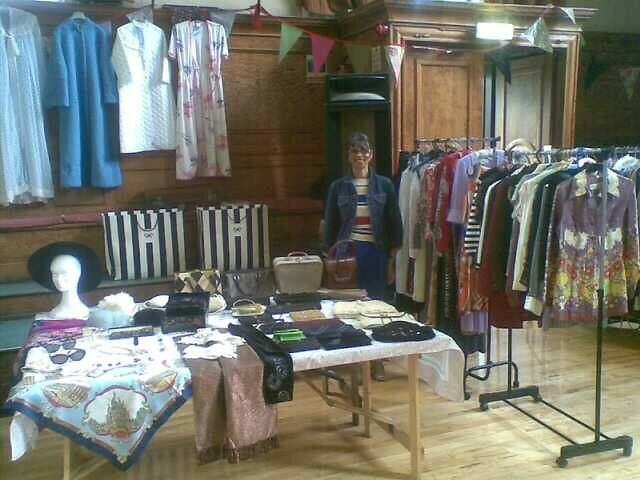 I'm so glad it all went well for you Sharon.The stall looked amazing and very spacious too. Your stall looks beautifully set out and it sounds as though you really enjoyed the day - wonderful! How amazing!!! I have to ask for more close up photos next time before I go straining my eyes trying to see EVERYTHING lol, you have such a great collection! I hope to pay your stall a visit. 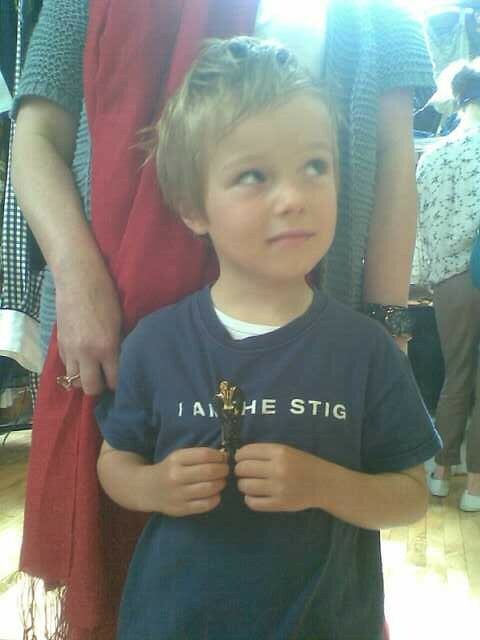 Le PG looks lovely in his new brooch, how cute! !